GREAT VALUE – 4 Br Home in Trumpeter Village. 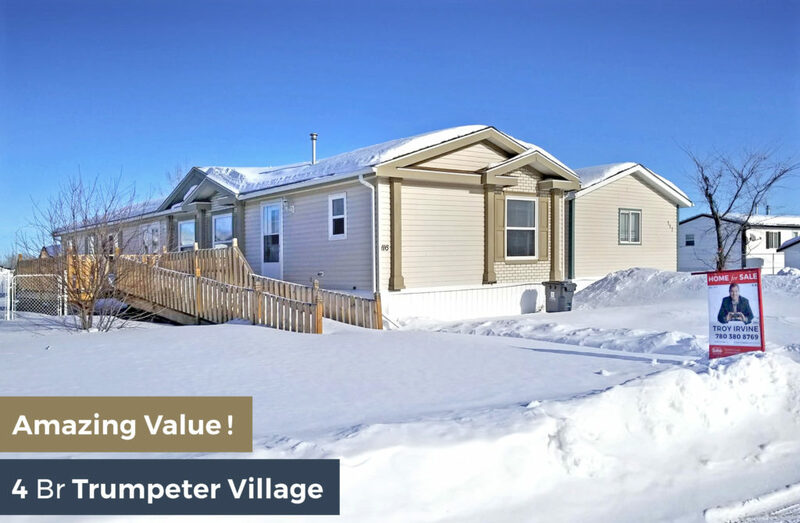 AMAZING DEAL - This one owner home in Trumpeter Village is the perfect starter family home, with its unique floor plan especially designed for families with small kids. 4 beds 2 baths 1,520 sq. ft.
4 beds, 2 baths and a master bedroom with ensuite, you will be hard pressed to find better value than this. Call me 780 380 8769 and look around before it's gone! Check out the kitchen with its pristine white cabinetry lit up by oversized twin skylights. The large garden doors lead out to a large deck, with a ramp for strollers or wheelchairs that can be removed if not needed. Yard is fenced, and backs onto the local park. Lot rental is only $508/month and includes garbage pickup and snow removal from main streets.